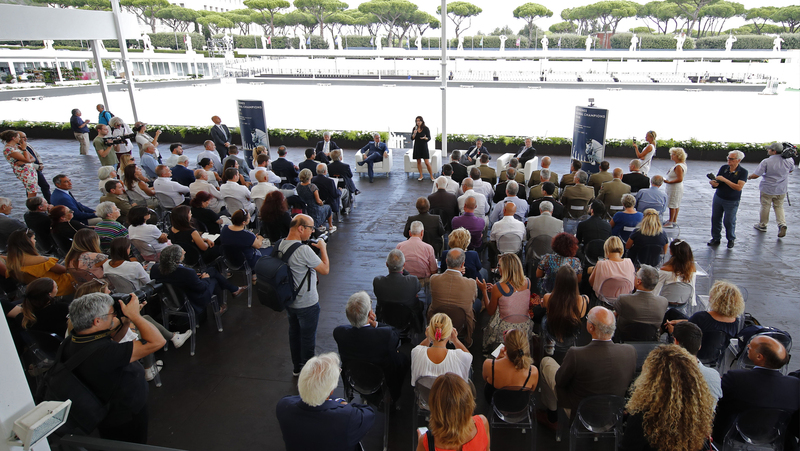 The 15th leg of the Longines Global Champions Tour Championship was officially kicked off today, with a pre-event press conference hosted at the spectacular Stadio dei Marmi in Italy’s capital city of Rome. To mark the 4th edition of the Rome event, Longines Global Champions Tour and GCL Sport Director Marco Danese was joined by LGCT Rome Event Coordinator Eleonora di Giuseppe, Senator Claudio Barbaro, Member of Parliament Federico Molicone and the FISE General Secretary Simone Perillo, as well as local athletes Emilio Bicocchi and Luca Marziani. Speaking to the local media, Danese gave an overview of what’s been a thrilling 2018 LGCT and GCL season so far, highlighting the excitement and importance of the upcoming finals in Doha, and the GC Playoffs in Prague. “The new innovation this season is the GC Playoffs in Prague (13/16 December). The LGCT and GCL brings top sport to unique locations around the world, from Miami Beach, to Paris, London to here in Rome, and we continue to work to make our sport accessible and bring new audiences to show jumping.” Danese also spoke of the support the home city GCL team, the Rome Gladiators, will expect to receive, with popular Italian star Lorenzo de Luca one of the team’s star strikers: "In Rome, the Gladiators will be the team to support, and we can expect great passion from the crowd for them. Only 16 teams can qualify for the GCL Super Cup, so it will be very exciting. In the LGCT Grand Prix, the winner will have a chance to qualify for the LGCT Super Grand Prix at the GC Playoffs, so far Alberto Zorzi has a place in the Playoffs, and the constant growth of the Italian riders make us hope for another victory this weekend!”. Senator Claudio Barbaro, who is a member of the committee in charge of public education and culture, spoke of the prestige of the forthcoming event: "The circuit is unique with his many faces - sport, environmental, culinary and social. It is perfectly in keeping with in the guidelines of the new government. We want to make sport become a point of togetherness, not only centred around competitive spirit, but also for all integrated activities." Member of Parliament Federico Mollicone, a member of the committee in charge of culture, science and education: “Sport, art and culture often has a common hero: the horse. This is one of the values of the Longines Global Champions Tour of Rome, which give us the nobility of the equestrian art, while also showcasing the beauty of Rome and the Stadio dei Marmi all over the world on a global platform." General Secretary FISE Simone Perillo agreed: "It is the fourth edition of an extraordinary event, a marvelous setting for equestrian sports: Rome is once again at the center of world equitation. It is not surprising that this circuit is called "Formula 1 of show jumping". I worked in that motorsport Championship, and indeed I confirm that the Longines Global Champions Tour has many parallels with Formula 1." With the event free to the public, there will be something for all the family with a varied and exciting programme on offer. As well as top sport, a variety of artists, painters and sculptors will again be present this year to pay homage to the horse: Master Francesco Scagliarini, known for his equine heads crafted of typical Salentinian materials as Cursi or Alezio stone, wrought iron, clay and olive wood; painter Tita Signorelli, from Turin, and shiatsu specialist Daniela Mariano, long time friends sharing a passion for the expressive and creative side of animal language, both equine and pets. Spectators will also be treated to entertainment from dancers, acrobats and comedians - all coming together for the special equestrian performance ‘I Cavalli di Roma. Il Carnevale Romano’. The event kicks off this Thursday 6th September, running until Sunday 9th September, with all the action streamed live via GC TV and selected classes on the official Facebook Pages.